For all the non believers.... I purchased an Armored Hull Boat Shield™ last Spring. My 30' Grady has been in the water with no bottom paint all summer. Not a molecule of any type of marine growth. Interesting. 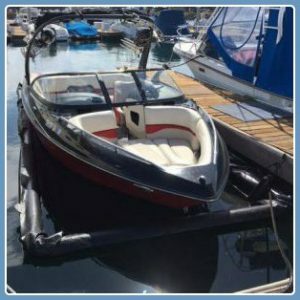 Can you share where you keep your boat? I only ask to get an idea of geography, water temperature and salinity since they are major factors in marine growth. If you are in the Caribbean I could believe it. Give it a try. 1 yr in the Caribbean. Why wouldn't something like this work? It just seems that you are parking your boat in a pool and not in the ocean. Ok I went to the website and looked around. Don't quite understand. The water you would be sitting in without it, is the same water you are sitting in with it. Sure it's not going to stay as "fresh" but waves will still get in, barnacle seeds will already be floating in, how does this work? I've got my boat in one, have had it for over 2 years, this is the second boat I've kept in an Armored Hull Boat Shield. They work. I have no bottom paint and do not dive the boat. 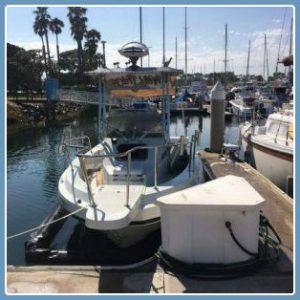 The water is indeed saltwater, there is a timer that puts in about 5 minutes worth of fresh water from the dockside spigot every day automatically, and you put in a cup or so of chlorine once a week. No growth, no barnacles, no algae. Where are the pictures? They aren't showing. Not much to see. Black plastic 'dam' around/under the periphery of the boat. Turn a plastic valve and the rear (with the floats) sinks under the transom allowing you to back out. When you pull back in, they give you a bicycle (style) pump to pump it back up and complete the seal. Takes about 6-8 pumps. And this is easier than painting the bottom - seems like you would have to fuss with it every time you use the boat (and sounds too much like work to me). $1500/yr bottom paint +haul out, plus $50/month for diver. Less than 2 minutes effort each trip. Plus resale, who wants a Fountain with bottom paint? I can understand how they work. My question is what about the growth on the outside of the shield? Is it a problem? Can it be removed? Will it eventually weigh the shield down until it is ineffective? Yes it (growth on the outside of the Armored Hull Boat Shield 'liner') is an issue. I pay a diver to clean it up once a year, he charges about $100. Can anybody give an idea of price? Does anybody have one of these in Florida? I keep my boat in a lagoon off Barnegat Bay, in New Jersey. Yes, there is growth on the outside of the shield. There is absolutely no growth of any kind on my hull. My hull has never been bottom painted. The boat has been in the water since May. Cost was about $100/ft of length. No big deal getting in and out, maybe an extra minute or two.. very simple to use.. I have no affiliation with the manufacturer. This is a well thought out, well made, product. I originally was looking for a lift, but was stymied by costs and permits. I did a lot of research and decided to give this a shot. I actually figured that there was a good chance that I was wasting my money, but really didn't want to go through the cost and hassle of bottom painting. So I figured I would take a chance. At this point, I am not sorry at all. By the way, both my neighbors, with lifts, who in May told me I threw the money away, and swore it could never work, have totally reversed there thoughts and opinions..... How it works > The water inside the shield is isolated from the lagoon water and its nutrients. Nothing can live inside the shield. There is an air operated (bell jar effect) gate the lowers and raises, thus opening the shield and allowing the boat to go in or out. .About 90 seconds to open and about 30 seconds to close...no electric, just operated by a manual Coleman air pump.... I have it tied to my buklhead, it would also work in a slip. no bottom paint and no corrosion on my outboard brackets. Before I purchased, I spoke with an engineer in The Florida Keys who built is his own 3 years ago (34' Trojan) ... no growth in 3 years!! I actually live up the lagoon from the ttles714. When he put it in I stopped to ask what it was and how it worked. Every time I cruise by I have looked for something wrong with this system. It works! Our Lagoon has almost no current, so marine growth is a problem. Even on my boats with bottom paint. I will definitely look at this when I upgrade my boats. 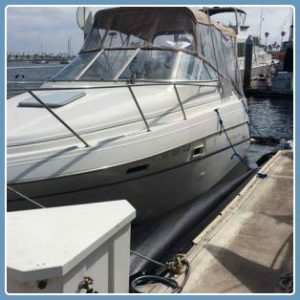 For more information on Armored Hull Boat Shields™ and how you too can begin protecting your investment, please check out our FAQ page or feel free to contact us here and we'll be more than happy to answer all your questions and concerns.